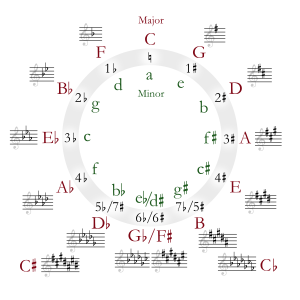 G minor is a minor scale based on G.
Its relative major is B-flat major. G minor is one of two flat key signatures that needs a sharp for the seventh note (the other is D minor). During the Baroque period, music in G minor was usually written with a one-flat key signature. Wolfgang Amadeus Mozart thought that G minor was the most suitable key for showing sadness and tragedy, and many of his minor key works are in G minor, such as the Piano Quartet No. 1 and the String Quintet in G minor. G minor is the only minor key he used as a main key for his numbered symphonies (No. 25, and the famous No. 40). In the Classical period, symphonies in G minor almost always used four horns, two in G and two in B-flat alto. G minor symphonies like Mozart's No. 25 often used E flat major for the slow movement, including Haydn's No. 39 and Vanhal's G minor symphony from before 1771 (Bryan Gm1). Most of Verdi's Requiem (the Dies Irae), is in G minor. See also: List of symphonies in G minor. There are many variations of G minor. G minor major 7th a G minor chord with a Major 7th. G minor major a combination of G minor and G major. G minor 6th a G minor chord with a Major 6th. G minor 9th G minor 7th containing A.
G minor 2nd a G minor with Ab or G#. G augmented minor the augmented version of G minor. G diminished has C#/Db instead of D.
G minor 7th-5 G diminished with minor 7th. G diminished 7th a G diminished with a major 6th. ↑ H. C. Robbins Landon, Mozart and Vienna. New York: Schirmer Books (1991): 48. "Writing for four horns was a regular part of the Sturm und Drang G minor equipment." Robbins Landon also notes that Mozart's No. 40 was first intended to have four horns. This page was last changed on 8 June 2016, at 17:41.